Monkey Island taught me everything I know..
Monkey Island 1 – A legendary game. Anyway, in an forlorn attempt to move away from my traditional, Godin esque posts about marketing and advertising, I thought I’d spoil you, dear reader, with a nostalgic saunter down memory lane. It concerns point and click adventure games – chiefly the Monkey Island series – and how they help you and get you thinking (I bet you’re wondering how I’ll work advertising into this…) in strange and different ways. Well, for the uninitated (and any planner aged between 18-40 who hasn’t played these games should immediately down tools and go and play them now – you heard me), they are what’s described as a ‘point and click adventure game’, where you click on objects/use them/talk to various people. In the first game, you play Guybrush Threepwood, a young wannabe pirate who seeks to earn his spurs in the fast paced world of pirating. As the games progressed, you went on all forms of random quests (including insult sword fighting, monkey kombat and all sorts of peculiar things). For more information on the series, check out the Wiki page on it. Pirates of ill-repute from Monkey 2 – animated for your pleasure. But the most important thing it teaches is lateral thinking. Yes, so do games like Civ 4, and a case could be made that as those are less linear than the MI series, they are better. But I disagree. Your average Monkey Island puzzle (or for that matter – Grim Fandango, DOTT or Sam & Max), though only having one solution, required you to use items in very strange ways – look at the second Monkey Island for examples of that – banana on a metronome anyone? Yet they were all rooted in some degree of common sense, unlike some other adventure games, which just involved you clicking on random objects until they worked together. And it’s this skill, this ability to think laterally whilst having your eyes set on the overall goal which I feel the communications industry has never required more of (aha, got a cheeky reference in there). So.. why are you reading this? Go and buy them all (1+2 are hard-ish to find.. but look around). Be prepared to lose many days of sleep wondering how to get across chasms with only a rubber chicken to help you. monkey island. awesome. i remember playing the first one as a kid on my amiga – must have been 10ish i guess – and it blew me away. happy days. Good man Doug. I knew someone out there besides me played ’em.I, also, played the first on a friend’s Amiga.I then got a PC, marvelled at the amazing graphics of 2, and have really enjoyed all of them..I’m a bit of an adventure game junkie – DOTT, Sam & Max, Indiana Jones and the Fate of Atlantis.. you name it, I’ve most likely played it.My nerdish tendancies are strong today. I should probably take up MMA tomorrow. If you like Monkey Island, play Blade Runner and Outcast. 2 of the best games ever. Fact.ps great post Will. I’m def inspired to get my video game posts on. oh nostalgical feeling. 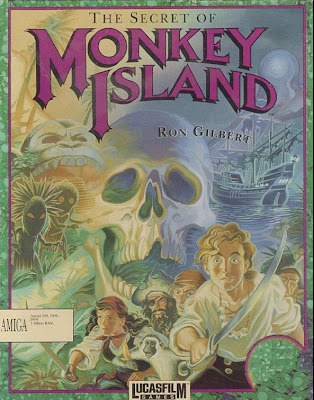 I bought the first Monkey Island on a flea market when I was 9 and I had to upgrade my Amiga 500 from 512k of RAM to 1MB to be able to play it. Imagine that: 1MB of RAM! Anyway a great game. Will do you know if it’s possible to get that game for MAC? Would love to walk around with my buddy Guybrush Threepwood again. Ha. I owned and finished Blade Runner – all of the endings as well.. damn right. Heh.No Outcast..mmm, this must be rectified. The original Sam and Max is probably still the funniest game I have ever played.Day of the Tentacle was also great. Also.You can get an emulator called ScummVM that lets you play these old games on certain other systems. You`re totally right. Monkey Island was one of the best videogames ever, well at least until the Playstation and the Xbox came through. What I liked more about it was the dialogue lines, those where hilarious… Those were really good times. Rob, that’s a brilliant tip with that ScummVM. Was said because the apple stuff I downloaded was only for the classic version. Hooray, yay! Will play tonight. Ha. Rob M – I knew about Scumm VM, but had never used it.. thanks for the reminder.